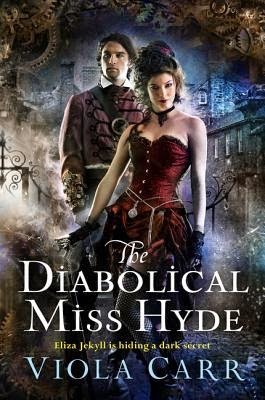 THE DIABOLICAL MISS HYDE by Viola Carr has been on my to read list for awhile. Happily, while checking Amazon prices for a few of my most wanted books, I found the ebook version for $1.99. Even better, it's not just a kindle deal. The blurb: "Magic, mystery, and romance mix in this edgy retelling of the classic The Strange Case of Dr. Jekyll and Mr. Hyde-in which Dr. Eliza Jekyll is the daughter of the infamous Henry. In an electric-powered Victorian London, Dr. Eliza Jekyll is a crime scene investigator, hunting killers with inventive new technological gadgets. Now, a new killer is splattering London with blood, drugging beautiful women and slicing off their limbs. Catching "the Chopper" could make Eliza's career--or get her burned. Because Eliza has a dark secret. A seductive second self, set free by her father's forbidden magical elixir: wild, impulsive Lizzie Hyde. Even if it means risking everything and setting vengeful Lizzie free . . ."